Headlines: Well it was a wet and cool start to the trout season weather wise but the fishing was certainly hot enough. Rivers have fished well for spawn run rainbows and the lakes have also fired. 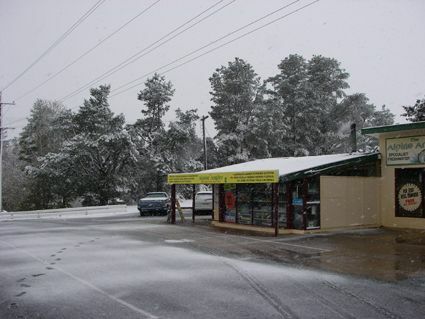 It is snowing at the shop and in the mountains as I type this today which will see even more water for the lakes and rivers. Lake Eucumbene continues to rise and is now at 30% plus! The ground being covered has not seen water for three years and there is plenty of food coming out of it which is attracting the fish in to the margins. Thanks for the early season pep talk. Managed to get some runs on the board including my first decent sized rainbow on fly. Dropped a few but managed eight all up around the Buckenderra area between Monday evening and Tuesday evening mostly searching around with wooly buggers. Most fish were around the 40-45cm mark and were all thrilling to chase (and catch). Wind was a bit of an embuggerance but once it died down, first and last light was the most productive times for me. Having said that, spotted some clunkers cruising around the lake margins right in the middle of the day. Itching to get back to continue the chase; see you again soon. 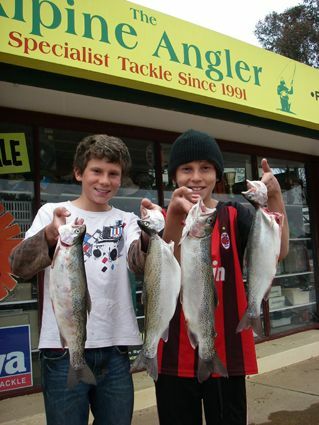 *Tony took young 13yr old Jacob Hoey (on left) and 11 yr old David Hoey out to Eucumbene and they had a great time in the Buckenderra area. They managed 19 fish for the weekend, mostly rainbows with two browns landed also. They used a variety of methods with fly and Rainbow trout Squidgies working well. Powerbait and scrub worms were the best baits. Came through too late last night to pop in. Had a great weekend at Jindabyne, caught a couple of Salmon and a few Rainbows. For a long time I have been really against power bait but I have been using it off and on for 3 years now with little success. That was until a couple of weeks ago I caught a small one up on Lake Lyell when I was passing through for an hour and had nothing else but powerbait in the car. So this weekend I decided to try a bit harder with it and it has paid off. Although the fish were caught on worms, mudeyes and powerbait I must say that the power bait really gave me confidence after the first day or two of catching. Orange nuggets were the thing went through a whole jar. Gordon underestimates himself - so I will tell you the truth. We have been fishing trout on all Lakes and Rivers in the Snowy's on Fly, Lure, trolling & Bait for over 15 years. The early days were always fruitful (to a degree ? - mid- 1990's - 'thumpers' avg. 3-5kg ......- but bring on the 2000's and we have only caught 1 or 2 over the space of 5 days - or none at all on our outings). Unfortunately, now we can only manage short trips down to Jindabyne ie. when we can manage to get away from our 4WD business. The last 5 years in Dec-Jan, April and even Oct long weekend have been very dodgy !!. But - We keep trying - that's why it's called 'fishing' and not 'catching' sometimes. We actually caught this time... On the banks of Waste Point (east) where we camped from 7.00am Friday 2/10/09 - We resisted the River (on Fly) to have a relaxing weekend... I believe it was really busy anyway. Friday 2nd (X1) - 3.30pm - 3kg Brown (Male) - released : - given back to the gods for luck. (Bait - Worm). Stayed up til 2.00am - but nothing else. Saturday 3rd (X2) - 3.00pm - 2kg Atlantic Salmon (Female) - released. (Bait - Powerbait- Orange Nugget). 4.30pm - 1kg Rainbow (Male) - sorry eaten. (Bait - Couta). Up 6.00am til 12.00am - but nothing else. Sunday 4th (X3) - 11.00am - 0.5kg Rainbow (Fly) - released obviously. Nothing remarkable - but I didn't see many other boats or shore-based fisherman catching in between times. We waited all day on Monday 5th until 7.00pm and not another bite - so headed home to Sydney- just missing the huge storm. Gordon was also out on his boat (near Thredbo river mouth in the bay) and had some non-barbed dalliances with a number of small trout over the weekend. He came back to the rat race in Sydney a 'Happy Camper'...very very happy 'his' trout were biting at last! Mind you- We noted that the water level is up from many a month - which is always good. Thank you so much for doing us the service of leaving the bait out for us. We will be back.